Animal Diagnostics Market size was valued over USD 2.8 billion in 2016 and is expected to witness more than 8.0% CAGR from 2017 to 2024. Growing trend of pet adoption along with rising prevalence of zoonotic diseases will drive animal diagnostics market over the forecast timeframe. According to the American Society for Prevention of Cruelty to Animals (ASPCA) 2018 statistics, nearly 3.2 million shelter animals in U.S. are adopted annually. Significant advancement in veterinary diagnostic and rising disposable income should drive industry growth. Several initiatives undertaken by public and private players to stimulate growth of animal sector will favour business growth. For instance, “Feed the Future” initiative undertaken by U.S. government and campaigns arranged by Community based animal health workers (CAHWs) in Kenya to support growth of animal healthcare sector will propel business growth. Numerous efforts undertaken by various organizations to reduce incidences of animal derived human infections will further propel industry growth. Growing demand for animal products due to reduction in meat prices in developing countries such as China will fuel growth of animal diagnostics market. Animal food delivers appropriate protein content as well as consists high value micronutrients including zinc, iron and vitamin, making it a popular food choice worldwide; thereby, stimulates animal diagnostics market growth. However, prohibitive cost associated animal test and low out of pocket expenditure on pet healthcare in developing countries such as South Africa will hamper market size growth over the forecast period. Clinical biochemistry accounted for largest market share in 2016 and is anticipated to follow similar trend over the forecast period. Development of instruments such as EUROLyser solo used to perform veterinary tests for diabetes, thyroid, liver diagnostics along with determining inflammatory and acute phase proteins status will drive segment growth. Growing demand for flexible devices capable of delivering on-the-spot in house tests results will further surge business growth over the coming years. Molecular diagnostics will witness lucrative growth over the forecast timeframe. Molecular diagnostics allow identification, detection, and genotyping of pathogens, thus resulting in industry expansion. Growing adoption of molecular techniques in livestock and veterinary research for vaccine development, studying host-pathogen interactions, microbiome and resistome analyses, development of diagnostic assays and genome analysis to optimize breeding will drive segment growth over the forecast period. Companion animals held largest market share in 2016 and should hold its position in future. Growing adoption of pet animals and rising disposable income will drive segment growth. Several initiatives undertaken by government to stimulate growth of animal healthcare sector will positively impact segment growth. Farm animals segment will witness considerable growth over the forecast timeframe. Growing demand for animal products and various organizations working towards reducing occurrence of animal derived human infections will drive segment growth. Increasing prevalence of zoonotic diseases will stimulate demand for animal diagnostics over the forecast period. U.S. animal diagnostics market accounted for largest regional share in 2016 owing to high pet adoption and disposable income. 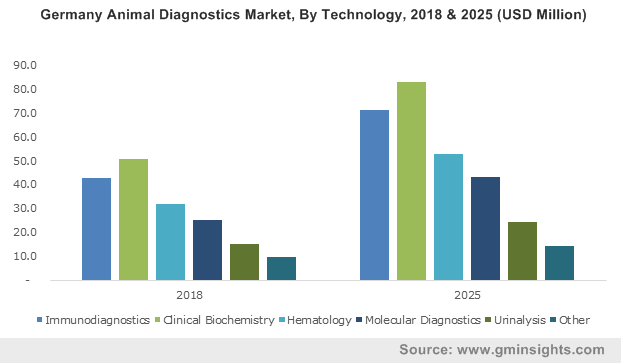 Technological advancements in veterinary diagnostics along with government initiatives to encourage animal healthcare sector growth will further fuel U.S. animal diagnostics market growth. France animal diagnostics market is anticipated to witness robust growth over the coming years due to increasing pet adoption, growing awareness about animal healthcare and favourable regulatory policy in the country. Rising research activities pertaining to production of veterinary diagnostics and reagents will propel business growth. Presence of major industry players such as Virbac will favour industry growth. Brazil animal diagnostics market will grow with significant growth over the forecast period. Growing demand for pet food and large pet population in the country will support industry growth. Moreover, initiation of programs such as Pet Brasil will positively impact industry growth. 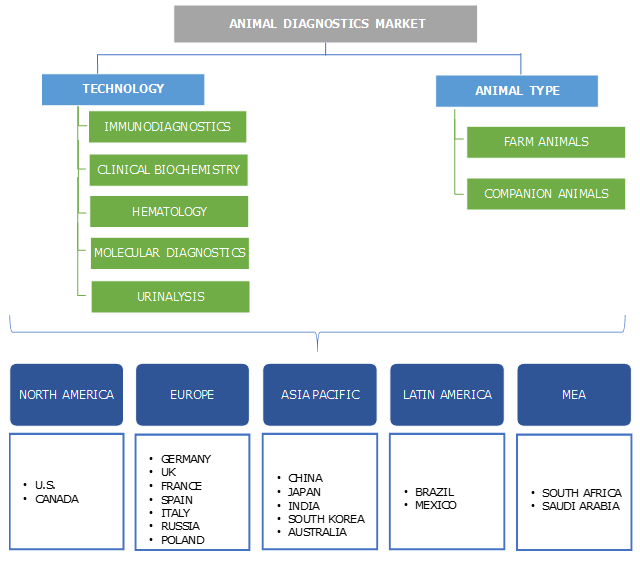 Some of the major players of global animal diagnostics market are IDEXX Laboratories, Heska Corporation, Zoetis, Randox, Virbac, Qiagen, Thermo Fisher Scientific, Neogen, and Abaxis. Industry players are focusing on research and development to develop superior veterinary diagnostic solutions. For instance, Zoetis launched new diagnostic instrument named Carysta HVC (High Volume Chemistry) in February 2018. The instrument is designed for performing high volume diagnostic test to advance productivity as well as reduce cost. Growing prevalence of zoonotic diseases and several initiatives undertaken by public and private organizations to reduce incidences of animal derived human infections will drive animal diagnostics market. Growing demand for flexible, precise instrument capable of delivering instant diagnostic results will propel growth of animal diagnostics market. Merger and acquisition, strategic partnership and collaboration are some of strategies adopted by market players. In May 2017, Zoetis received grant from Bill & Melinda Gates foundation to strengthen veterinary diagnostic network and animal healthcare infrastructure in Nigeria, Ethiopia, and Uganda. Qiagen entered into strategic collaboration with Singulex in January 2017 to broaden company’s molecular testing business portfolio.